Australian Churches Refugee Taskforce background on SRSS cuts. CAPSA has put together some clear and simple actions you, your parish, your students, or your colleagues can participate in during these weeks. Please don’t feel that these are your only options, be as creative as you wish, or modify these to suite your situation. The CAPSA team are on hand to support in any way we can! We will collate actions from across the country and make our voice heard. We are all responsible for what our government does in our name. We must let them know we want positive change. ’30 Days Notice’ reflection activity: How would you feel if you were given 30 days notice before your sole source of income was cut? How would you look after yourself, or your family? Get your class, workplace, or parish to complete this activity and we will deliver your reflection to key politicians and policy makers. The more the better! Host a Circle of Silence: This is a vigil-type event where students and/or staff gather in a silent circle to recognise the injustice faced by many refugees and people seeking asylum. This can be as public or as private as you wish. Take a photo and CAPSA will bring these actions together. Great at lunchtime at school, or before/after mass. Class/Assembly outside: Students and staff can act in solidarity for those who will no long have a #roofovermyhead, due to losing their SRSS support. Pray for Refugees, Migrants, and those seeking asylum: We can reflect and be present together or alone. Coordinate your own activity and let us know what you are doing via the registration form or email. Sign up for CAPSA updates and calls to action: Put your details in the form (scroll down to the bottom of this webpage) to stay in touch and be a part of coordinated efforts across the country. 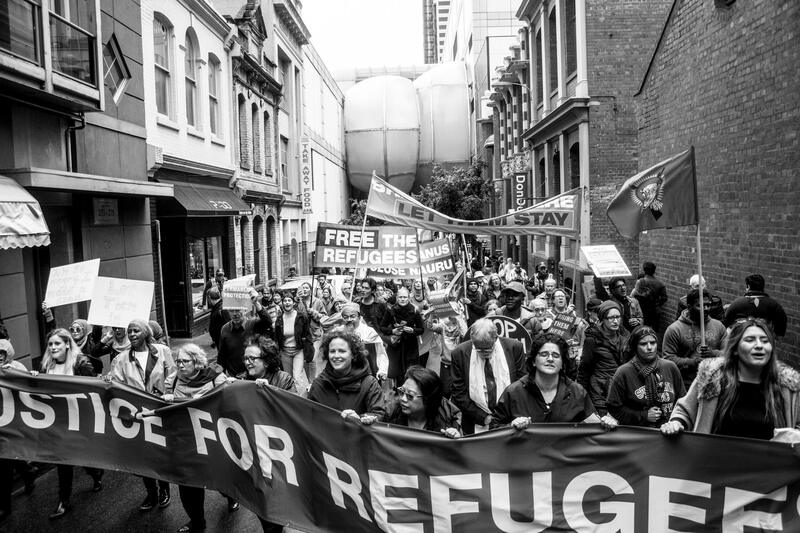 20/8/18 – Planned destitution of people seeking asylum: An “act of grace”? How would you and your children survive if you had nowhere to live, no job, and no income, and no family in Australia? Most Australians will be shocked to hear that our government is pushing families and individuals into destitution and homelessness. That’s right – thousands of people who are seeking asylum here in Australia, who are on Bridging Visas waiting for their claims for refugee status to be decided, are soon to be without any income support. Currently if they cannot find a job, or are unable to work due to illness, people seeking safety in Australia get basic income support ( 89% of Newstart allowance), and some are eligible for housing assistance – this is known as Status Resolution Support Services or SRSS. These people fled traumatic circumstances, and having reached Australia, have been left in limbo for years waiting for their refugee status to be determined. Many were held in detention for years, either in Australia or on Nauru or Manus Island, and those in the community were denied the right to work until recently. It is estimated that over 7,000 people, including families with children will lose income support. Australia is better than this. We cannot stand by and allow this to happen to people who are seeking protection in Australia. The Australian Refugee Action Network is encouraging you to TAKE ACTION NOW to draw this issue to the attention of politicians and the wider community. Most people who do not have a permanent visa find it very difficult to get secure work. Of those who are able to find work, most are employed in part-time, casual or seasonal work with no job security and are earning less than a living wage. Stop this further humiliation and cruel treatment of people seeking our protection. You may also want to say that you will not vote for a government which is treating people in this way. Ideally copy your email (BCC) to all Coalition MPs and Senators. See this list: Federal MPs and Senators email and phone details May 2018. 6) Consider contacting your Local Councillors also and suggest they commit to supporting these asylum seekers. Organise or join actions: Express your outrage and get your friends and others to support the advocacy for refugees, organise through church, clubs etc. Utilise vigils, letters to local papers, community radio. People who are seeking to be recognised as refugees are living on Bridging Visas while their claims are being assessed, which can be for a period of years – some have been waiting for more than 5 years for a decision. Currently these people are eligible to receive 89% of the minimum Centrelink payment (if they are not able to work), and some families are eligible for housing assistance –this is known as SRSS support. Minister Dutton is changing the eligibility to SRSS, drastically cutting support to people seeking asylum, reducing the number of people given SRRS support from over 13,000 to fewer than 5,000 people by the end of June 2018. This is likely to leave more than 7,500 people, including children, hungry and homeless. Most people seeking asylum now have the right to work. But most people on bridging visas are unable to get permanent work because their residency status is unresolved. At best people may be employed in insecure, or casual jobs, and are at risk of exploitation by unscrupulous employers. Some people are unable to work because they have health issues relating to their traumatic experiences, including their time in Australian funded detention centres. A significant number of people seeking asylum are already surviving on emergency handouts from a range of charities, and living with friends or community members, often in vulnerable or unstable conditions. Charity organisations will not be able to support all of these people. These changes will leave thousands homeless, destitute and hungry. These changes are entirely at the discretion of the Minister for Home Affairs. It is unclear why Minister Dutton is forcing people into destitution – it is an unprincipled act of cruelty, and appears to be aimed at destroying any hope that people still have of being given protection in Australia. The Australian Churches Refugee Taskforce is also encouraging people to contact the Prime Minster regarding the cuts to SRSS. See details here, including a postcard to send. Let us know how you went: email austrefugeenetwork@gmail.com or on Facebook or Twitter. Agencies providing support in each state are listed.